I cut a sheet of 12X12 cardstock down to 8.5 X 11 and embossed. and machine stitched around the edges. Four rectangular pieces of 6X6 paper were cut and adhesive applied with the 3" Sticker Maker. I used the Photo Tape and applied a strip to the center (back) of each photo. small amount of tape works fine for me! And I LOVE the look of an old typewriter font for my journaling. sure that it was large enough to cover the journaling. my printer and then reprinted the same journaling. chose to cluster my photos and embellishments in one area. I had a lot of fun putting this layout together and implementing my brand new embossing tool! 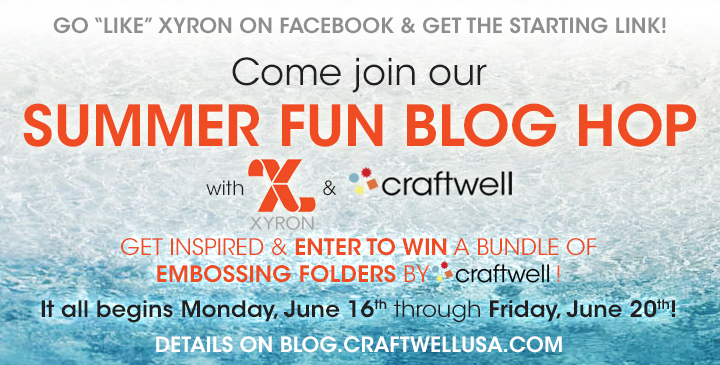 And please visit the Xyron Blog and "like" them on Facebook. that is a nice layout, love the background texture. Love the layers (and the papers) in this project along with the clustering of the embellishments and pics. What a fun layout. Great work. Great layout, love your papers and the embossing folder. Great page - it really pops and has nice dimensional effects.